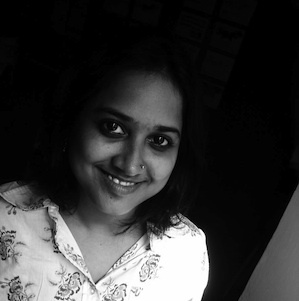 Rupali Gupte is an architect and urbanist practicing and teaching in Mumbai. She is interested in the contemporary urban condition and a cross disciplinary investigation of this phenomenon. She locates her practice at the juncture of this inquiry. She has received her Bachelors degree in Architecture from the Kamla Raheja Vidyanidhi Institute of Architecture (KRVIA) (1998), and her Masters degree from Cornell University (2003) She has also been a Fellow at The KRVIA and at SARAI-CSDS, Delhi. Currently she is an Assistant Professor at the KRVIA, where she co-ordinates the Fellowship Programme and the Exchange Programme. She is a founder member of the Collective Research Initiatives Trust (CRIT), an organisation that works on research and practice in urbanism and a partner with RRarchitecture101, a design practice. precinct in the city. In 2001, through the Design Cell, she worked on a multimedia archive of the city's architectural production, titled 'Metropolitan Lab', which was displayed at Tate Modern's inaugural exhibition 'Century City'. Currently she is involved in studying Fishing villages in Mumbai and looking at alternatives to mainstream solutions offered to these groups. From 2001 to 2003 she completed her Masters at Cornell University, where she produced a book titled 'Tactical City, Tenali Rama and other stories of Mumbai's Urbanism', a semi-fictional history of Mumbai for her thesis. From 2003-2004 she worked with Kohn Pederson Fox New York, on a mixed-use architectural project in the U.S.A. but returned to India in 2004 to co-ordinate the second phase of the project on the Cotton Textile Mills in Mumbai through the office of Charles Correa Associates and the Urban Design Research Institute. This project involved activism against the laissez faire sale of cotton textile mill land in the heart of the city, through producing material for public interest litigations and making a citywide exhibition to display possibilities for the design of these lands for public use. In 2005 she was invited along with Prasad Shetty as a consultant to the Eritrean Government for preparing a Comprehensive Plan. In 2006 she joined the KRVIA again as full time faculty, where she teaches Design Studios at various levels, Design Dissertation, Architectural theory, Urban Studies at the undergraduate level and Research Methods and Design Dissertation at the Masters level. As Founding member of CRIT in 2004, she has been involved in a comprehensive study of housing typologies in Mumbai, a detailed study of slum typologies and is currently working on making a manual for the design of slum houses. She has also been involved in designing several housing projects for slum communities in Mumbai. She is involved in private architectural practice, through RRarchitecture101 in partnership with Rohan Shivkumar, involving design projects for houses and community infrastructure. collaborative, where she made an installation in Khoj's courtyard titled 'Pothole City'. She continues to research and write extensively on the urban condition and has lectured extensively in India and abroad.